Relay : Dennis told me that each house had 4 runners ( 3 boys & 1 girl ) . Result : 1st Soar ( Dennis Brammer receiving the baton: on the right ) 2nd Trent ( Stuart Futter receiving the baton from Brian Robinson : on the left ) 3rd Derwent ( Roy Bembridge receiving the baton from Emlyn Walters : in the middle ) . The winning time was 75.5 secs. 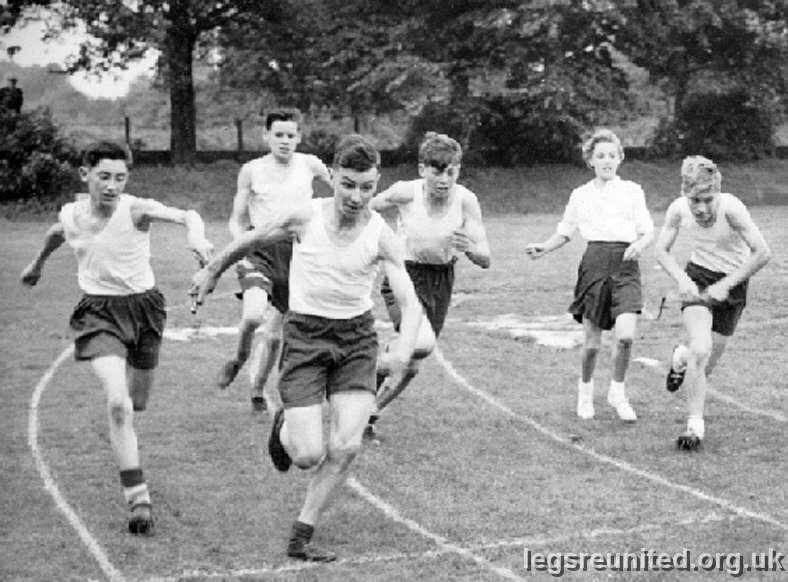 There were only 4 boys who took the places in the Intermediate individual running events ( 100 yds/220 yds /440 yds ) : Dennis Brammer ( a first & a second ) . His twin brother Keith ( a first and a third ) . Stuart Futter ( a first, second & third ) . Roy Bembridge ( a second & third ) .